The ORACLE username and password that provides access to the data that the program uses. The application short name of the responsibility whose concurrent processing options to be used. The name of the responsibility. If the name of the responsibility includes spaces, enclose that name in double quotes. The uppercase username of the application user whose concurrent processing options to use. A flag that indicates whether to wait for the submitted request to complete. 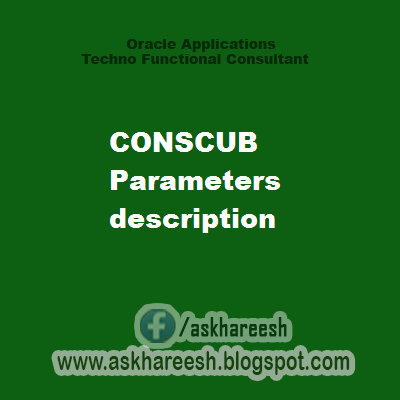 If one leaves this parameter out, the default value of N makes CONCSUB return to the operating system prompt without waiting for the request to complete. Set WAIT=Y to have CONCSUB check the request status every 60 seconds and returns to the operating system prompt when the request is completed. A flag that separates the program specific parameters from the operating system parameters. The application short name of the concurrent program. The uppercase name of the program. It must be the short name that was enter in the Concurrent Programs window when defining a concurrent program. A descriptive name for your program. Introduced in R12, set to org id required for the report to be run with. The interval between resubmission (a positive integer or real number). Use this parameter along with REPEAT_INTERVAL_UNIT to specify the time between resubmissions. The unit of time used for the interval between resubmissions. The available units are MINUTES, HOURS, DAYS or MONTHS. Use this parameter along with REPEAT_INTERVAL to specify the time between resubmissions. Whether to time the resubmission interval from the requested start time of the request or from its completion. Set this parameter either to START or END. The default value is START. The date and time to stop resubmitting the concurrent request. Because this date format includes a space, one must enclose the date in double quotation marks and single quotation marks. Whether to show this concurrent request on the View Requests form. Specify NO, YES, ERROR or WARNING. The value IMPLICIT=NO allows the request to appear on the View Request form. The default value is NO. The number of days after which to repeat the concurrent request, calculated from the last requested start date. The program specific parameters. If a parameter includes spaces, enclose that parameter in double quotes, then in single quotes. If a parameter contains a double quotation mark as part of the argument, precede that mark with a backslash [\].